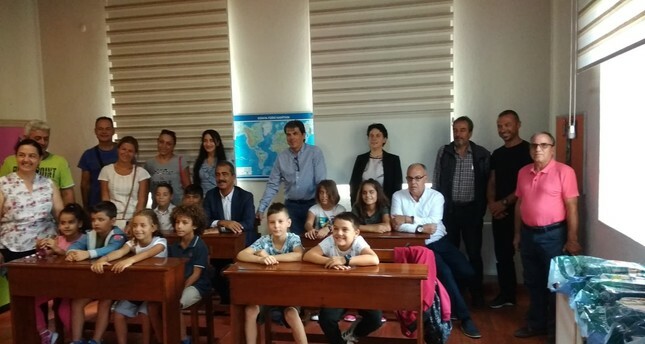 Students pose with their parents and administrators of schools in Gökçeada. An unprecedented rise in the number of students enrolled at a Greek-only school in Gökçeada shows how this island off Turkey's western coast is embracing its multiethnic past. In the last decade, more Greek families have been arriving and settling back down where their ancestors left decades ago. The Gökçeada Greek Private School, or Aya Todori Primary School as it was originally called, is located in the island's Zeytinli village, that was once home to a large Greek community. More than 3,000 people lived in Gökçeada before many left en masse in the 1960s amid tensions between Turkey and Greece. The school, opened in 1951, was closed down in 1964. It was left empty for years before it was restored by the Greek community and started admitting students again in 2013. Only two students enrolled that year. In the new school year that started on Monday, 47 students are attending the single-floor school. They are children of Greek families who have been returning in recent years. In the past three years alone, 20 Greek families settled in Gökçeada. Laki Vingas, a prominent figure in Turkey's Greek community and head of the İmroz Education and Culture Association that runs the school, said they fully repaired school and its infrastructure shortcomings in the last five years. "We had 38 students last year in total in nursery, primary, middle and high school. We were proud and happy then but this year we have even more students," he said. Hüseyin Çınar, the head of state-run education authority in Gökçeada, says they expect more students next year, at least 60, with more families settling in the island. Gökçeada, Turkey's largest island, was once primarily inhabited by Greeks. It was even called İmroz, after its Greek name, before a decision to change it to Gökçeada in the 1970s. A decade after its inception, the Republic of Turkey imposed a set of policies targeting minorities in the country. With their properties confiscated through legal amendments restricting property ownership and anti-minority sentiment gaining popularity, Greeks were forced to leave the country. Gökçeada now hosts a mixed population of Turkish and Greek-Turkish citizens with Turkish people dominating the population. Residents of Turkey since pre-Ottoman times, the Greek community had faced a turning tide in the final days of the Ottoman Empire and a few decades after the foundation of the Republic of Turkey. A string of riots targeting minorities and increased hate speech, as ties between Greece and Turkey soured, led to the departure of community members, particularly to Greece. Some lost citizenship over the years as they did not return for the compulsory military service. The controversial wealth tax imposed in 1942, targeting rich non-Muslims, a pogrom in 1955, and the deportation of non-Muslim Turkish citizens in 1964 added to "a fear of the state" among non-Muslim minorities. Greeks in Gökçeada particularly suffered from deportation as Turkish and Greek relations were tense at the time due to conflict over divided island of Cyprus inhabited by Turks and Greeks.